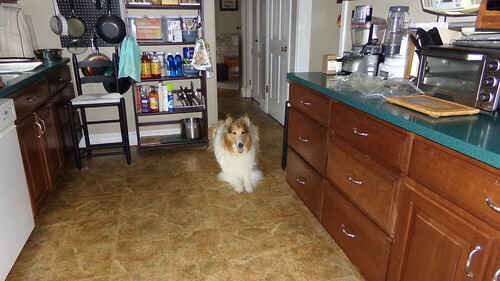 ← Dog Daze, or What to Feed the Dog? Hands up – who wants to change the subject? That’s everyone. So here are what keep me getting up in the mornings… my duties as a wife and mother (of dogs), that’s what. I have four things I must do every week, at varying intervals. All four things are for Paul. I have to make the bread every 5th day. One loaf lasts Paul exactly 4 days. I make a separate loaf for myself, slightly different depending on my mood. His is always made from Bob’s Red Mill 10-grain Bread Mix. Mine is currently made from Hodgson Mill 9-grain Whole Wheat Bread Mix, but sometimes it’s Italian Cheese-Herb, sometimes other varieties… I love Hodgson Mill mixes! I used to make “from-scratch” cookies. But that got old after quite a few years of it. I am tired these days and cooking is not my natural forte… so I use mixes now. For cookies, I get four different mixes in packets by Betty Crocker: sugar cookies, oatmeal cookies, peanut butter cookies, and chocolate chip cookies. The sugar cookies are very versatile as I’ve been experimenting with them lately, adding different flavorings like maple, butterscotch, peppermint extract (oh those are so good! ), etc. I have a whole bunch of little bottles of extracts to choose from. I’m thinking that lavender and even rosemary might be a great idea for “savory” cookies! 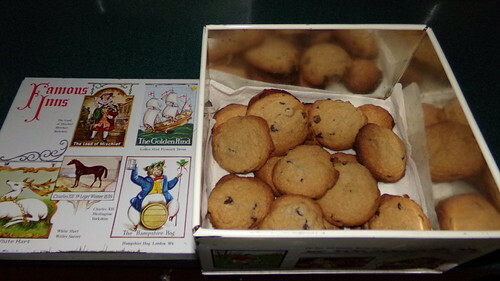 Yesterday I made chocolate chip, my personal favorite, although I’ll only eat one or two of this whole batch. They ARE for the Big Guy, after all. 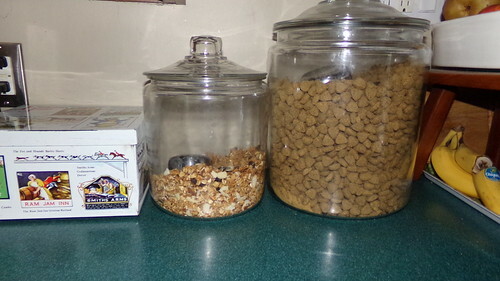 For many, many years now I’ve made Paul’s breakfast cereal – homemade granola (pictured above, smaller glass canister. Larger one is Kibble!). I don’t eat a regular structured breakfast – probably my biggest problem! A cup of coffee is all I require want until around noon each day. But Paul is a creature of his habits, and his habit is to have a bowl of granola (before I started making it, he had Cheerios), milk on it, a glass of orange juice, a piece of his 10-grain bread for toast, and jelly or jam on the toast. The same thing every day, 365 days of the year. For lunch also every single day he has 2 pieces of his bread with peanut butter & jam/jelly on it, a cookie or two, a piece of fruit, and water. Every. Single. Day. 4. MAKE THE ICE CREAM. Paul works hard enough at his job that he can afford to eat ice cream every night. Unless I forget to make it and he runs out, which only happens maybe twice a year – and it did happen this week! I made it yesterday (coffee w/a scoop of Ovaltine for a mocha flavor), and there it is above. 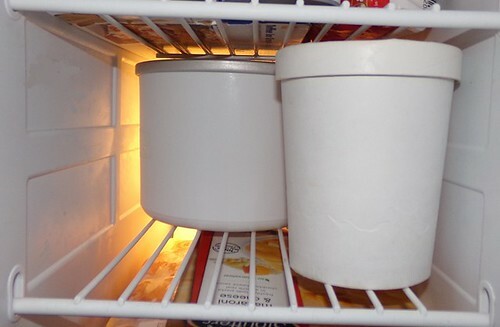 Behind the container is the ice cream maker bowl which has to live in the freezer all the time so it can be frozen and ready for use when you want it. I have a big bag of those white heavy cardboard ice cream containers which can be washed once or twice after use and used again. One batch of ice cream equals one containerful. Doc has told me to get dog once we have moved. I am glad to have all this new info now. I hope your fur babies get better soon. Whole Life has freeze-dried dog and cat treats – chicken, venison etc. Sometimes chewy.com has them on sale. For treats, we give our dogs the dried liver, chicken and cheese treats you find in the pet stores. They’re just dried food, no extra ingredients. We do make sure that NOTHING is from China, though. You can’t trust the label on products from China. Could be that Kip is allergic to pumpkin. Or maybe you just changed things over too fast. It’s always best to introduce new foods slowly. Thanks Teri. I needed to hear that personal review of Acana! Kip had his first breakfast of it this morning. He’s developed severe diarrhea during all of this because he’s been getting a little of what I’ve been feeding Em… plus I thought Em would benefit by introducing a little “pure pumpkin” along with the other bland items… well, she seems OK with it but Kip isn’t! He’s had a spoonful a couple of times a day all week and now he’s got the runs. He had us up to let him out 3 times last night! Bex, somehow I’d totally missed your post about Em the other day. Sorry! I’ve read it now and am going to welcome you to the family of Acana feeders. That’s what we feed our dogs. I looked at the type you’re feeding her and that’s exactly right. You want something that has NO grains, and that’s what you’ve got. There are a couple of other versions of Acana that are also grain-free. We feed our pups the Wild Prairie version, also grain-free. I found out years ago that as dogs get older they can’t handle grains. Especially, they cannot handle the rough corn that is put in so many dog foods as filler. I had one dog that was about as sick as poor Em before I learned about going grain-free for dogs, and I’ve stuck to it ever since. Never had digestive problems with any of my dogs since that time. You’ve done exactly right by Em. Giving her those very bland foods until her system isn’t irritated anymore is exactly the ticket. Then you can start to add in the Acana a little at a time until you have her fully on Acana. I see you’re very busy with keeping everyone properly fed. You may not think much of your cooking but I think you’re amazing. Bex, somehow I’d totally missed your post about Em the other day. Sorry! I’ve read it now and am going to welcome you to the family of Acana feeders. That’s what we feed our dog. I looked at the type you’re feeding her and that’s exactly right. You want something that has NO grains, and that’s what you’ve got. There are a couple of other versions of Acana that are also grain-free. We feed our pups the Grasslands version, also grain-free. I wished you lived here and were doing all that for me. I have a bread-maker. 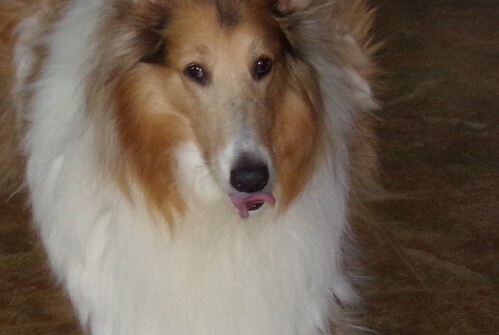 The dog that chewed the cord while being a puppy has been dead for four or five years. I am wornout just reading what all you have made to eat…Love the photos of each. So glad that you reported Em is a wee better. Well, it ain’t over til her tests come back better, but I am hopeful… very hopeful. Thanks Maggie. I have visions of you making lots and lots of canned items in the future soon!!! 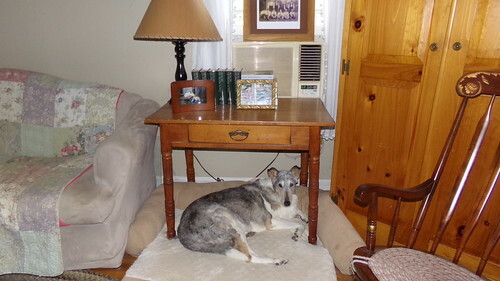 Love this entry Bex, it reminds me that when our dust settles we too will be back to homemade living! So glad to hear that Em is feeling better! That was scary.